The Picayune and KBEY 103.9 FM Radio Picayune are hosting their annual Toy Drive from 6 a.m.-3 p.m. Wednesday, Dec. 7, including live broadcasts by KBEY. MARBLE FALLS — While we take the time to celebrate Thanksgiving and remember the things for which we're thankful, it's also a chance to remember those who might not be as blessed. But, you might wonder, what can I do? I'm just one person. Well, you can make a difference in a child's Christmas with a simple gift. Across the Highland Lakes, many children actually face a Christmas morning with no gift under the trees. Through Christmas isn't just about the gifts, it's a part of it, and something to which kids look forward. So to help all kids enjoy that special feeling Christmas Day, The Picayune and KBEY 103.9 FM Radio Picayune are hosting their annual Toy Drive from 6 a.m.-3 p.m. Wednesday, Dec. 7, including live broadcasts by KBEY. "We'll have collection station in Marble Falls and Burnet," Wyatt said. 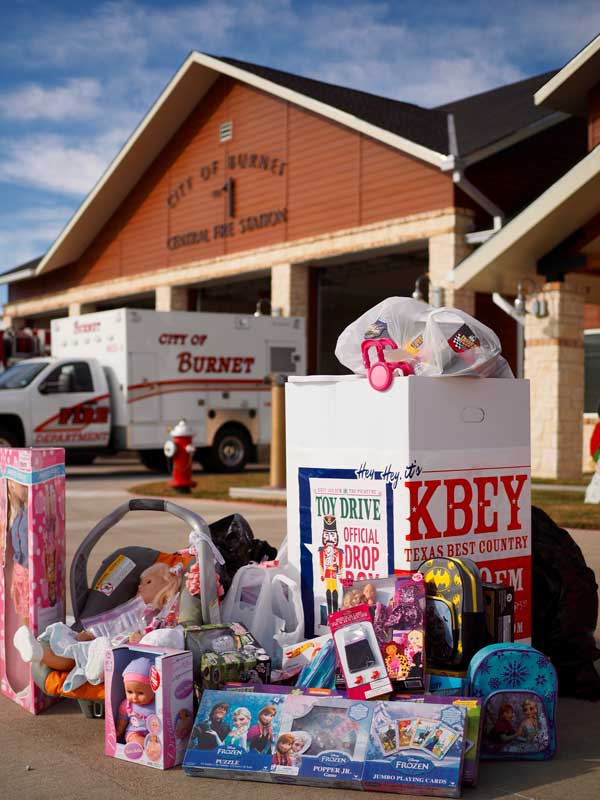 The Burnet Fire Department is hosting a drop-off spot at the station, 2002 S. Water St. in Burnet. Chevy-Buick of Marble Falls is the second drop-off location, 2301 U.S. 281 North in Marble Falls. Though The Picayune and KBEY Toy Drive is still two weeks away, with Black Friday (Nov. 25) and Shop Small Saturday (Nov. 26) around the corner, it's a good opportunity to pick up a toy or two for the drive. The Toy Drive benefits Highland Lakes Christmas is For Kids for children living within the Marble Falls Independent School District boundaries and Burnet County Santa's Helpers, which provides gifts to children in the northern portion of Burnet County. The organizations, as well as other similar groups, cross-check with each other to cut down on the chance of duplicate giving. Go to KBEYFM.com and ThePicayune.com for more information and other drop-off sites as they become available.